This baby back ribs recipe is as easy as 3-2-1: 3 hours on smoke, 2 hours in foil, one hour finished with BBQ sauce. The 3-2-1 cooking method is a tried-and-true technique used by competition BBQ teams around the country, and these smoked baby back ribs are a real crowd pleaser! Features our Kansas City Southern Rib Rub. If you're having a barbecue and you don't want to spend a lot of time during the event on food prep, this baby back ribs recipe is perfect. I know, I know. You're thinking, "What? They take six hours from start to finish!" That's true, but you can do it all ahead of time. You can smoke the ribs the day before, and cook in foil/finish the next day. Time the ribs to finish about 10 minutes before your guests arrive, and you can enjoy cocktails and conversation with your guests instead of flipping burgers over a hot grill. Start your smoker using your choice of chips or pellets. Remove the silverskin from the underside of the ribs. Season both sides liberally with Kansas City Southern BBQ Rub. Remove ribs from smoker, and preheat grill or oven to 225°F. 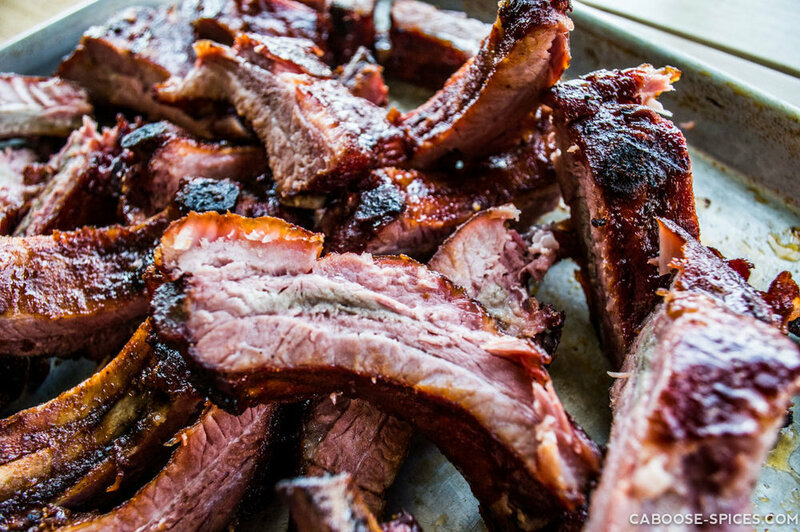 Brush ribs with honey. Wrap them tightly in foil, adding 2 tablespoons of apple cider vinegar to the packet before sealing. Remove ribs from foil. Brush with your favorite BBQ sauce, and return to oven or grill and bake for one more hour at 225°F. Kansas City Southern Rib Rub is our nod to the great tradition of Kansas City BBQ. While it was made for use on ribs, it's great on other meats too! Give it a try on the above recipe, or try it on beef skewers, lamb, or pork shoulder. The possibilities are endless!